In October 2012, Minnesota State received a Lumina funded Credit When It's Due grant aimed at increasing degree completion rates for early transfer students. Through a process known as reverse transfer, we transfer your university coursework back to one of your previously attended community colleges to see if you are eligible to receive an Associate of Arts (A.A.) degree. An A.A. degree is comprised of the 40 credit general education package known as the Minnesota Transfer Curriculum (MnTC) and 20 credits of electives. 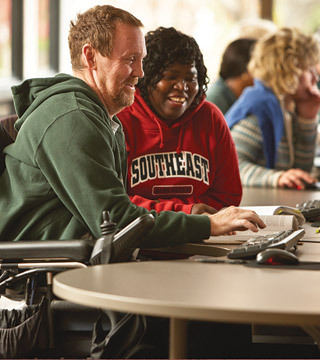 Coursework completed for an A.A. degree will transfer and be applied to a bachelor's degree. What are the benefits of earning an A.A. degree? You will be recognized as having met the general education requirements (Minnesota Transfer Curriculum) at all Minnesota State Colleges and Universities, which may result in an accelerated path toward bachelor’s degree completion. You may be eligible for better job opportunities and in some cases, higher wages. Research indicates that you will be more likely to remain in school and complete your bachelor’s degree. How much does it cost to earn an A.A. degree through reverse transfer? The reverse transfer process, including the transfer of Minnesota State transcripts, evaluation of completed coursework, and degree conferral, is provided free to you as student. If you’ve attended a school outside of the Minnesota State system, you may need to pay a small fee to have an official copy of this transcript sent to your community college. How do I know if I’m eligible for reverse transfer? What happens when I provide consent for release of records? Once we receive your consent, the community college you previously attended will access your Minnesota State transcripts and transfer back applicable coursework to fulfill degree requirements for the Associate of Arts degree. Your community college will notify you when all requirements have been met, and they are ready to award your degree. In the event that you are missing requirements after evaluation, they will assist you in finding appropriate university level coursework to complete the requirements. Will earning an A.A. impact my eligibility for financial aid, scholarships, and/or military benefits? Earning an Associate of Arts degree will not impact your eligibility for state or federal financial aid or military education benefits while you're pursuing a bachelor's degree. If you are receiving private scholarship money, please check with the awarding organization to ensure that earning an associate’s degree will not render you ineligible for the scholarship. Please contact Jessica Migler at jessica.migler@minnstate.edu or 651-201-1815.